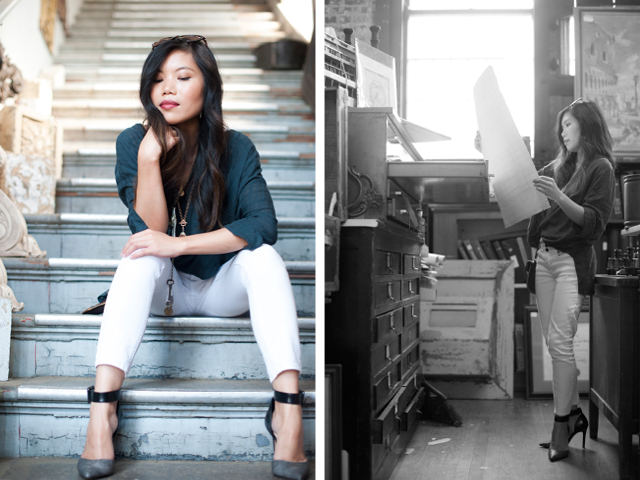 Last week I had the pleasure of enjoying my Sunday afternoon with fellow Memphis fashion blogger Sophorn Kuoy. Her beautiful taste in unique decor paired with her minimalist yet eclectic approach to fashion is such a breath of fresh air as it is distinctly unoriginal to the current wardrobes gracing the streets of Memphis today, it is her style. As I try to find the words to describe Sophorn’s style, I hear whispers or west coast whimsical with a twist of southern belle. Tell us a little bit about your blogs and what has insired you to become a writer? I write and photograph for Memphis Flyer Style Sessions and my own personal lifestyle blog norococo. Style Sessions feature local people and their stories around style whether it’s creating or exemplifying it. My personal blog is around inspiring design, food, and life in Memphis. I treat it as my portfolio for graphic design, architecture, and photography. The name represents an aesthetic and approach of simplicity. I started it after I got laid off from architecture work and needed a way to feel connected to Memphis by writing about it and really getting to know the city. No past professions inspired writing really. I’ve always wanted to write since elementary school. I think if there were such things as blogs in the ‘80s, I would have started one when I was 9. Where did you go to college and what did you study? I went to Auburn University and graduated from their Bachelor of Architecture and Bachelor of Interior Architecture program. I always did photography throughout high school and college. Where is the best place that you have ever photographed? The best place I’ve ever photographed is when I visited my brother in Singapore (design and architecture heaven). What is your must have beauty product? Must have beauty product for me is blush or bronzer. It would be the one thing that makes my skin instantly look healthier and happier if I had no other make-up on. What is the best, most exciting thing left on your bucket list? The most exciting thing left on my bucket list is probably very cliché – it’s to visit Paris. I would pretend to be a local while still visiting the Eiffel Tower and carrying my camera around. In the back of my mind, I would always be on the look-out for great street style to photograph. How to Choose the Best Hat for your Face Shape? Love this feature! Love Sophorn! She's stunning and her work is amazing!